Hello! 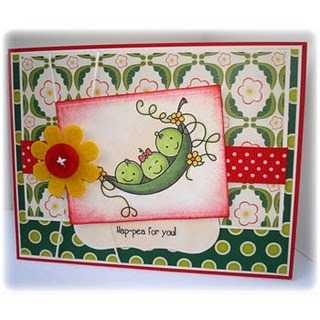 Today I have a new McMahon Five Designs card to show you that uses a Studio 313 image called "Peas and Thank You". This is just the cutest set! It comes with several pea images and adorable sentiments. I chose the three peas in the pod image to use on my card. My sketch is by Mojo Monday, and the paper is Cosmo Cricket. Be sure to check out the McMahon Five Designs Blog to see the rest of this week's new releases! Hi Amy - I love the way you have used this image - it is such a cute one isn't it! too cute! this is so sweet, Amy! What a cute card Amy! Love that image!! Digital Tuesday Challenge: "I Love the Sea!"